Students applaud during a 2017 Harpur College of Arts and Sciences Commencement ceremony. Image Credit: Jonathan Cohen. Students applaud during a 2017 Harpur College of Arts and Sciences Commencement ceremony. Photography: Jonathan Cohen. 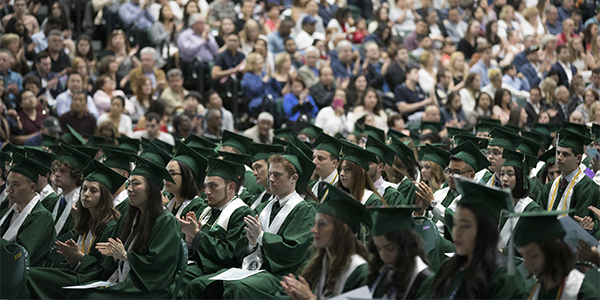 Binghamton University will confer nearly 4,000 degrees for bachelor’s, master’s and doctoral candidates when it holds nine separate Commencement ceremonies the weekend of May 18–20. For the first time ever, an alternative graduation ceremony will be held to accommodate observant Jewish students who would otherwise be unable to attend their graduation. This year, the University’s Commencement Weekend falls during the Jewish holiday Shavuot – the feast of weeks. Celebrated seven weeks after the second Passover Seder, Shavuot begins at sundown Saturday, May 19, and ends the evening of Monday, May 21. As a result, Binghamton University will hold an alternative Tekes Siyum Commencement Ceremony for 45 students, beginning at 9:30 a.m. Friday, May 18, in the Anderson Center Chamber Hall. An alternate graduation Tekes Siyum dinner will be held from 6:30-8 p.m. Thursday, May 17. The remaining 10 ceremonies will be held in the Events Center. More than 2,900 of the degrees awarded will be baccalaureate degrees, and more than 800 master’s students will cross the stage. One hundred and three doctoral candidates will be hooded. Each school and college will have its own ceremony, with Harpur College of Arts and Sciences holding three ceremonies to accommodate all of its graduates. The Decker School of Nursing will hold its ceremony at noon Friday, May 18, and the Graduate School ceremony will be held at 4 p.m. the same day. With the exception of the Decker School of Nursing and the College of Community and Public Affairs, all master’s candidates will be recognized at the Graduate School ceremony, when doctoral candidates will be hooded. Three honorary doctorates will be awarded at the Graduate School ceremony, all to Binghamton University alumni. The Doctor of Humane Letters will be awarded to Aaron Mair ’84, one of the founders of the environmental justice movement, who will speak at the ceremony; and to Ali Çarkoğlu, PhD ’94, professor, higher education administrator, political commentator and pathbreaker. The Doctor of Laws will be awarded to Asunción “Sunny” Cummings Hostin ’90, former federal prosecutor, columnist, social commentator and multi-platform journalist. Çarkoğlu will speak at the College of Community and Public Affairs ceremony at noon Saturday, May 19, and Hostin will speak at the Harpur College of Arts and Sciences ceremony at 12:30 p.m. Sunday, May 20. For more information, contact the Commencement Office at commence@binghamton.edu.